E = mc 2 is probably the best-known formula in the world, changing our understanding of the very universe we live in. However, my universe revolves around a very different formula: liquid + gelling agent = jello. Jello has been around for centuries. 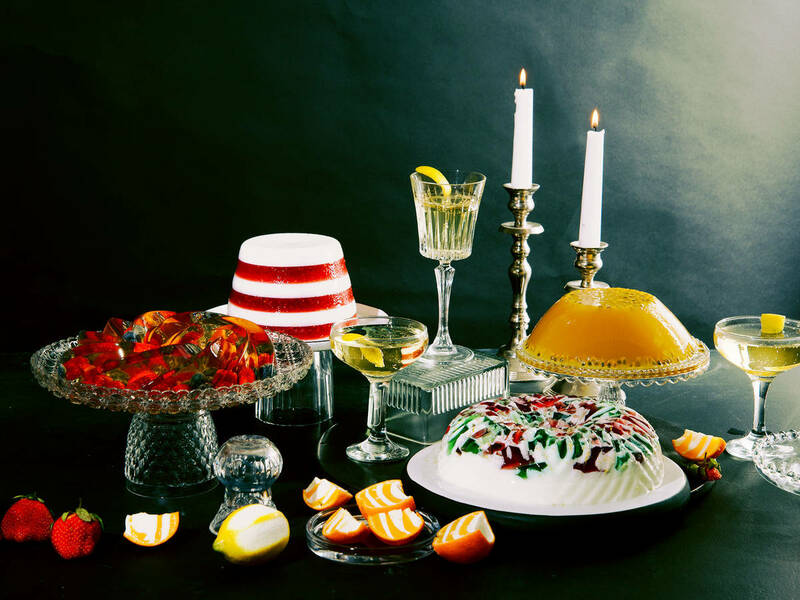 From Henry VIII of England’s rosewater jello, to the 17th century favorite, mock bacon and egg jello, to today’s jello cocktails—jello has never been out of style for those seeking a truly creative outlet in the kitchen. The sky is the limit—rather, the size of your fridge is—when it comes to jello. You can make alcoholic jellos, triangle jellos, glow-in-the-dark jellos, jello buildings, multi-coloured jellos, or simply the classic storebought, just-add-hot-water-jello (where my love affair with it began). It takes no experience, no training, to make something truly spectacular—and therein lies the wonder of jello. Unmatched for creativity, unmatched for simplicity, and able to turn a room of even the most serious adults into kids in an instant. That’s why it’s perfect for New Year’s. Take your favorite drink, add gelatin leaves, and you now have your favorite libation as a dessert. Do you have passion for jello (like the German man who broke the World Record this year for amount of jello eaten with chopsticks in 1 minute)? Maybe not. But it’s definitely an unusual New Year’s treat that your guests will remember beyond 2018. In any case, you’re only two stops away: Imagine the jello you want to make, however outrageous, then simply consult the magic formula. Do you have a favorite jello? Do you fancy yourself a jello maker extraordinaire? Comment and post your creations below!